Last week, I wrote about ShortShip, a Firefox extension that sorts eBay search results by the actual price with shipping included. In the past couple of months eBay has been switching its user interface so that it will look more “Web 2.0ish.” That’s nice and everything but this redesign hinders the functionality of the ShortShip extension. ShortShip was programmed to work with the old user interface. I contacted eBay customer service asking for some information on how to change the way eBay displays its search results so that I can view the old interface. But alas, they said it was not possible! What’s more, the creator of ShortShip does not have any plans soon to tweak the extension so that it will be compatible with the new UI! Hello, you’ve probably noticed that eBay changed how it displays items in the search and browse view. This disabled ShortShip’s functionality. I was wondering if you were working on a correction for this eBay update. Thanks so much for such a great extension! I frankly hate the new setup, and I am kind of hoping that they go back to the old version. As soon as they make up their minds and I can get the new version on my machine, I’ll start migrating it to the new search setup. Thanks for your email, if you have any other comments, please let me know. I’ve grown very accustomed to the luxuries of using ShortShip. I could not just stop using it and give up. I had to find a way to circumvent this problem. Web 2.0 relies on a lot of technologies from newer browsers like DHTML, CSS, and Ajax. Generally, older web browsers cannot support all of the features. Consequently, when (good) web designers and programmers upgrade the code of a web site to Web 2.0, they also add an accessibility feature that will seamlessly downgrade the code so that people with old browers can view the content. eBay is no exception to this rule. 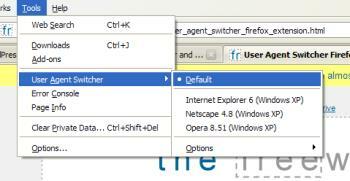 User Agent Switcher is a Firefox extension that masquerades the web browser and operating system so that it will appear to the web site server as something else. I use Firefox 2.0 in Windows XP SP2. Using this simple extension, I can make any web site believe that I am actually using Internet Explorer 4.0 in Windows 98 SE. So, I did just that. I cleared all of my cookies and set myself as an old browser. The Wikipedia User Agent article tells you every piece of information you will need to mimic any web browser. Then, I revisited eBay and voila! I get the old eBay user interface. I guess eBay saves this information in a cookie since even after I deactivated the User Agent Switcher extension, eBay continued to display the old UI. However, I don’t know how long the honeymoon will last. My guess is that I will always be able to do this since eBay wants to attract a wide audience. 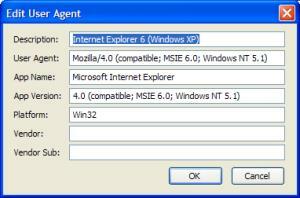 With that goal, they also have to make their web site accessible for everyone - even for people who still use IE 4. This technique of User Agent masquerading doesn’t only apply to eBay and ShortShip. It is a common tactic that is used when trying to access information from other websites. For example, a website will not let Firefox users access it since they don’t use Internet Explorer 7 or greater. You can use this extension to make it look like your browser is actually IE 7. Another scenario would be when you’ve found the perfect search result in Google but access to it requires a subscription. Sometimes, websites allow Google crawlers to access subscription-only information to boost their SEO. Masquerading your browser as a Google crawler can privy that information to you. This entry was posted on Thursday, January 25th, 2007 at 4:40 pm	and is filed under Extensions/Plugins, Hacks, Internet, User Interface. You can follow any responses to this entry through the RSS 2.0 feed. You can leave a response, or trackback from your own site. ShortShip - Sort eBay Listings by ACTUAL Price! buy further ways and also selcet a place to store them.